In the wake of recent comments by the Archbishop of Canterbury, Rowan Williams there has been renewed debate on the subject of ‘Big society’ the coalition government’s conceptual framework for social policy in the United Kingdom. Over subsequent days a debate ensued in various news media about the comment Williams made regarding democracy and the ‘policies no-one voted for’ which were rebutted by the government alongside careful remarks on the freedom to speak which the Archbishop had exercised. The idea of democracy in the United Kingdom being brought into question is perhaps so far-fetched that we are reticent in pursuing this argument, in attending to the question with the same vigour that we would perhaps afford to other nations whose political stability appears more precarious. However, the links between ‘Big society’ and democracy have been unearthed in the area of Governance, in particular, Network Governance . Network Governance is a method of governance that involves the shrinking of state involvement in the governance of an organisation, project, or indeed as a wider philosophical project, the nation. Purpose-driven bodies are formed out of what are regarded as relevant stakeholders such as (depending on the project) utilities, entrepreneurs, community representatives, financiers, experts etc and charged with the task of design and sometimes implementation of initiatives to include but not exclusively, policy. Around this table should sit an elected member of parliament who is charged with the task of what is called ‘meta-governance’. However, few such people are capable of such a task and often delegate this role to another. Network Governance can be viewed as empowering in that local actors are able to have influence on governance activities and people with real expertise or experience are part of the planning process. However, the absence of a democratically elected representative does pose a problematic issue in that those we elect have to stand accountable for their actions, we know their face and the office where we can submit our democratically sanctioned right to complain, their career depends on our satisfaction. Network Governance (NG) does not afford us such transparency. Additionally in classic NG, contracts are socially binding as opposed to legislatively binding, hence whilst this means some community members are enabled in decision-making at a local level, at the same time the output and application of resources from the public purse are not safeguarded in a legal framework. This is how Big Society can be described as a post-neoliberalist movement, however in fact it brings market influences much deeper into the nitty-gritty of community politics without the fail-safes of democracy. Put simply, we may not all agree with the views of the members of the network who have been given the power to bring change, importantly we didn’t elect them to this position and therefore they do not legally represent us or necessarily have the best interests of the nation at heart. In this way, concerns over a threat to democracy emerge. Grace Skogstad has looked at this through an EU lens considering what she terms ‘input legitimacy’ an increasing problem for purpose-driven bodies in the EU. Indeed, there has been much work on localised governance in Geographical studies and in 1998, Imrie and Raco argued that new local governance was not in fact dissimilar in many ways to the old model, citing the presence of third sector actors on committees alongside councillors and indeed how the controlling of local governance by the central government powers was equally a threat to democracy. This shows that the critique of Big Society here as I have outlined is not itself unproblematic however, it is not one we can afford to ignore. Those of us who have worked in the third sector know that the idea of big society is not a new one, neighbourhood and community based initiatives have long been present on the social landscape. Recently, many have argued this over and over in the media, however maybe this is not what the coalition government are advancing. 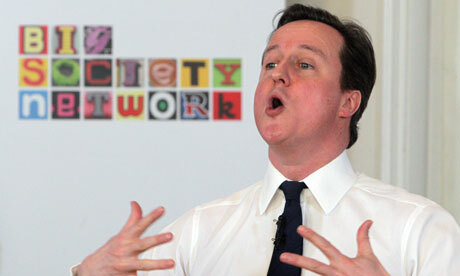 Perhaps their idea of Big Society is one that is more concerned with governance and a political legacy. Big Society has never explicitly been billed as Network Governance, however there are some striking links between and the picture above is perhaps a clue. Perhaps as we watch so many nations fighting for democracy we should be reminded of the fragility of our own and the need to constantly nurture and protect it. This entry was posted in Transactions of the Institute of British Geographers and tagged Big Society, coalition government, Cultural Geography, democracy, Development, Economic Geography, Environment and Society, Global Issues, governance, Network Governance, Political Geography, politics, Social Geography, third sector, Urban Geography on June 12, 2011 by Michelle Sushikala Brooks. As the dust begins to settle in Cairo the people of Egypt are jubilant at the success of their 18 day revolution in effecting regime change and toppling the government led by Hosni Mubarak for 3 decades. Now, as they prepare to play the long game waiting for free elections in September, the people, the revolutionary council and the ruling military must walk the tightrope of civic peace. Throughout the peaceful protests, distinctly multicultural and bursting with references to gender equality, poverty, religion, state-led violence and political freedom the activists displayed visual representations of the state through the lens of the working classes. Why do I mention this? Amidst the macro-scale geopolitik at play and the roar of the oppressed and unheard there is also subtle resistance at work here. The use of imagery on banners and placards and voices on facebook became the ‘weapons of the weak’ (Hammett 2010:6) , weapons that became available in the face of unequal access to public resources, corrupted state-owned t.v./radio/newspapers. The script and symbolism in the banners, facebook pages and tweets began the process of self-assertion of nation and in the interim, this meant a disconnect with the previous regime. It is a media that can reach beyond borders and through societal strata, one that the ageing clunky oppressor was ill-equipped to outrun. Increasingly there is a call for a more critical reading of the role of visual metaphors in the construction of ‘nation’ and the sentiment behind national identities (Dittmer 2005:628). In the image below, the use of comic book imagery is clearly anything but innocent or child-like, indeed it is a powerful and effective political tool in it’s cause of freedom from tyranny. 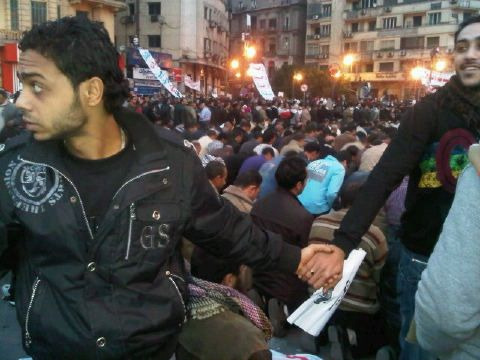 Throughout the protests, the activists have repeatedly expressed their unity, Christians protecting Muslims as they prayed from pro-Mubarak forces and clearly chanting ‘Egypt for the Egyptians’. There are many accounts of people watching events unfold around the world on T.V.’s, computers and listening to radios choked by the solidarity of this multicultural society overcoming everyday, that which so often divides and disables cohesion in the western world. Indeed there is no doubt that these events have been an outstanding victory for the people of Egypt, for human dignity in the Arab world and for freedom of expression more widely. However, in time the ousting of the autocratic leader may prove to have been the easy part. 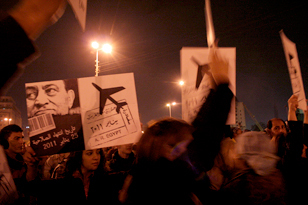 The vision of Egypt as portrayed by the government was one of submission and secularism, there was no room for dissent or protest and public displays of religiosity were banned, all under the state of emergency since 1981 (but periodically dating back to 1967). With two thirds of the nation under the age of 30 for many this is the only Egypt in living memory, an Egypt ruled by a military government whose hand reaches into every area of governance, commerce (from petroleum to bakeries), media and education. It is difficult therefore to imagine the magnitude of the economic and political loss in status to the military if it is replaced by a civic democratic system of governance based on merit and a public mandate. Whilst these concerns are bound to dominate in future months, we will remember for some time, the courage of the Egyptian people, oppressed and thwarted for too long, circling in squares and squaring the circle. This entry was posted in Area and tagged Arab World, Cultural Geography, Development, Economic Geography, Egypt, Egypt governance, Environment and Society, Global Issues, Middle East Politics, Political Geography, protests, resistance, revolution, Social Geography, Urban Geography on February 13, 2011 by Michelle Sushikala Brooks. Mounting tensions reached boiling point this week off the Korean peninsular. In a seemingly unprovoked attack, North Korea shelled the tiny island community of Yeonpyeong which lies on the disputed maritime border between North and South Korea. The ﻿Northern Limit Line (NLL) was drawn by the then United Nations Command following the 1950-1953 Korean War and is a line that South Korea must not transgress. However whilst this was agreed between South Korea and it’s allies, mainly the United States, it was contested by a then severely beleaguered North Korea. The NLL which is a curved line (see map above) effectively maroons five (South Korean) islands in the coastal waters of North Korea. This effectivly renders the islanders as the ‘outsiders within’ a perilous life to say the least where ‘within’ is North Korea. Much has been written in human geography about the externalisation of people who whilst holding citizenship of one nation, are geographically positioned in the hands of another, often adversarial neighbour (see work by Alison Mountz). Mountz’ work is in the context of state fear of immigration however the processes of externalization reveal the use of island communities in bearing the burden of wider political sabre rattling. Additionally, the Korean islands lie amidst some of the worlds richest fishing stocks of hermit crabs, a commodity fought over by America, Japan, and France and jealously guarded by China and North Korea in the past. For a country that has seen food aid from South to North Korea reduced to a trickle since the new administration took charge, devastation to farming from recent floods, and crippling aid sanctions from the west, North Korea has the opportunity to take a meagre portion of moral high ground and has done so at a strategically important time. The incident took place amidst planned joint naval exercises between the U.S. and South Korea near the disputed border just a few miles to the north; the political temperature then climbing further with the arrival of the U.S. (nuclear) aircraft carrier USS George Washington leading to accusations of ‘﻿gunboat diplomacy﻿‘ by America. North Korea has promised ‘a merciless military counter-attack’ should there be any transgression of the territorial boundary (whilst clearly acting without mercy towards the residents of Yeonpyeong prior to any such transgression). Unfortunately for the small fishing communities on the islands all of this has meant many nights spent in reinforced military bunkers on top of this weeks fatalities and obliteration of property. The presence of the elite South Korean military command post has not had a deterrent effect and arguably provides North Korea with a proximate and hence cheap military target. China has indicated it’s annoyance at the military exercises and is calling for diplomatic engagement with North Korea, refusing to condemn the actions of ﻿Kim Jong-il﻿. China is the single biggest provider of aid to North Korea and ﻿Beijing﻿ has kept dialogue open despite a plethora of violent and threatening outbursts from Pyongyang over the last few years. Importantly, for China, North Korea is a buffer zone between it and the western-allied South Korea. The question is whether Beijing is prepared to continue walking on egg shells to keep dialogue open with North Korea in the face of pressure from the west to ‘get tough’ with the Jong-il administration. Whatever the strategy, the world is no longer in any doubt that peace on the prevailing Korean fault-line, lies undoubtedly in the hands of China. 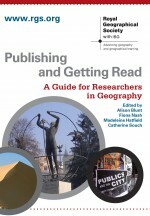 Read about the spatiality of contentious politics for the journal Transactions of the Institute of British Geographers. This entry was posted in Transactions of the Institute of British Geographers and tagged American politics, border, China, Cultural Geography, Development, Economic Geography, Environment and Society, Global Issues, maritime, military, North Korea, Political Geography, Social Geography on November 28, 2010 by Michelle Sushikala Brooks. In 1985 a tapestry of the Picasso masterpiece ‘Guernica’ was donated to the United Nations by Nelson Rockefeller in recognition of the international mandate held by the organisation. The artwork depicts the catastrophic consequences of a distant geo-politik that pitted a superior military air power against an unsuspecting rural, artisinal village. Hitler had agreed to help Franco with his nationalistic ambitions, the plan sent German and Italian bombs reigning down on the small Basque village of Guernica in northern Spain. On market day, at 4.40pm on April 26th 1937, three hours of non-stop carpet bombing and high-calibre gun-fire began amidst the sounds of the only defence the villagers could muster – the church bells. The town was reduced to rubble with most of the casualties predictably, women, children and animals (arguably the result of choosing market day to perpetrate this act of violence). The strategy sought to demoralise the Basque people who stood in the way of absolute power for Franco. The painting ‘Guernica’ depicting the scene painted by Picasso, who was living in Paris at the time, only returned to Spain in 1981 due to Picasso’s request that only when democracy ruled should the painting be repatriated. The painting has come to represent many things to many people all over the world in the various countries in which it was exhibited, most often an anti-war symbol or a rebuttal to nationalism but sometimes such historical artefacts continue to have resonance in the present day. On the 5th February 2003, General Colin Powell addressed the United Nations Security Council attempting to convince them of the need to invade Iraq. Later upon leaving, he walked through the hallway of the 2nd floor where politicians would traditionally stand for the cameras and past a tapestry of the iconic anti-war symbol ‘Guernica’ which unusually, on this occasion had been covered with an enormous drape. However, though Picasso’s warning was hidden and silenced, in hindsight the message is deafening, and perhaps timely, this remembrance Sunday. Read article ‘War and Peace’ by Derek Gregory for T.I.B.G. This entry was posted in Transactions of the Institute of British Geographers and tagged Art, Cultural Geography, Development, Economic Geography, Environment and Society, Global Issues, peace, Picasso, Political Geography, remembrance day, Social Geography, Spain, war, Women on November 14, 2010 by Michelle Sushikala Brooks. Yemeni women hold up a poster portraying a child bride during a sit-in, to show support for a child marriage ban, outside the parliament in Sanaa, the capital, on Tuesday (Abdullah/Reuters). On the 11th October 2010 a UNICEF press release highlighted concerns over education of children in Yemen. In many regions the majority of school-age children are not in education due to the continuing conflict between the government and rebel forces. A joint campaign between UNICEF and the government aims to achieve Millenium Development Goals that have a target of bringing all children into education by 2015. Needless to say progress has fallen drastically behind schedule and UNICEF is calling for all development partners to accelerate their efforts towards education and immunisation for women and children in Yemen. The problems faced by women and children overlap in Yemen for many reasons including that of early marriages which are a major obstacle to providing education for young girls (see article by Rachel Cooke for the Guardian). This in turn leads to loss of opportunities for work and autonomy, hence it is a significant cause of poverty and distress among women. However, despite growing conservatism and difficulties in the public sphere localised women’s NGOs continue to work hard to support education for women and children (read about the work of Rising Voices /video interview with Ghadia Al Absi) . In the wake of today’s revelations of a package bomb orgininating in Yemen and bound for the U.S. it is perhaps useful to remember the linkages between poverty and terrorism and indeed poverty and religiosity in attempting to understand the trajectory of this event. The linkages between poverty, civil discontent and terrorism have been discussed frequently in the academy (Barros et al 2008). Yemen is in this light a textbook case. Ranking 151st out of 177 countries in the Human Development Index of the UN, an index measuring such things as infant mortality and life expectancy: it can be seen that Yemen has one of the lowest HDIs in the world and indeed is the poorest of all the Arab nations. This is only exacerbated by dwindling natural energy resources, an internal war and an education system that has all but collapsed. Writing in the UNICEF press release above, Geert Cappelaere, UNICEF Representative in Yemen highlights the crucial role of education in any peace-building initiative. With this in mind today is perhaps a timely opportunity to notice and discuss equilaterally, any attempts to show women of Yemen who have chosen to be in education as aligned with those against peace. However, it may be crude and mechanistic of me to view recent revelations in the news-media as only damaging to Yemeni women in education. In fact this may be about diffusing a western discourse of commenting on oppression of women in countries such as Yemen. An agenda seeking to damage and undermine support for them from the west. In time, much time, no doubt the course and origins of this cruel attempt on the lives of innocents will be revealed. However, in the meantime the war goes on and though it is a process through which poverty touches all, it is important to note that in Yemen, the face of poverty is undoubtedly female. This entry was posted in Geography Compass and tagged Cultural Geography, Development, Economic Geography, education, Environment and Society, Global Issues, Political Geography, Social Geography, terrorism, Urban Geography, Women, Yemen on October 31, 2010 by Michelle Sushikala Brooks. Recent headlines in India about a disabled boy who was refused entry to a temple have raised questions around the wider problem of social stigma concerning disability in India. Temple authorities in Mysore, south-west India are reported to have forcibly removed the wheel-chair bound boy and his family later claiming that issues of access and language barriers had precipitated this action. The numbers of people living with disabilities in India could be as high as 90 million (World Bank 2007), however, due to the stigma attached to disability in India this number is contested. Political will to improve the social and economic wellbeing of disabled people is evidenced in for example, landmark legislation to protect the disabled (1995) and ratification of the UN convention on the rights of persons with disabilities (2006) yet despite this many Indian states have failed to implement policy requirements and guidelines in this area. It can be argued that implementing such policies is greatly hampered by lingering social reluctance to accept disabled people as legitimate actors in public space, forcing them to live on the margins of mainstream society experiencing a greater degree of poverty and social exclusion than others in their age /regional/caste or class grouping. Additionally disabled women are severely disadvantaged further by disability, through vulnerability to various forms of abuse and then often also lose the right to care for their children (UN Enable 2006). Much work has been done in geography on disability issues and the social separation experienced as a result. In an interesting article for Area, Edward Hall (2004) highlights social exclusion of the disabled but then problematises social exclusion policy, drawing attention to the focus on employment as a method of ‘inclusion’ in UK policy which does not address the social support that can be gained through the informal sector. Likewise in India, policy reflects state logic the implementation of which (or lack of) in turn is a reflection of wider societal stigma. Categorising disability in India largely occurs in childhood and is determined as a condition whereby the person suffers less than 40% in any ability, a certificate is issued and the disability is rarely assessed again (Ministry of Law and Justice 1996). This hints at the assumption by the state that the disability is fixed and the problems associated with it lie in stasis throughout the persons life course. It is therefore regarded as a condition arising from the persons being or natural state, rather than polysemic or changeable and indeed having a life course of its own. In diseases such as Polio in which symptoms worsen with time and Cerebral Palsy where assessment must take place over time until adulthood policy implementation presents the disabled person with a serious disadvantage. The aligning of the characteristics of the disability with that of the problems experienced by the individual absolves society of social impacts felt by the disabled such as abuse, exclusion, employment discrimination or educational shortfalls. This fatalist approach perpetuates commonly held perceptions in the public consciousness that disability is an affliction brought about by moral or religious shortcomings. The headline story was in fact about someone with cerebral palsy, where sadly the ocular symptoms of the disease can mask a fully active and able mind, one for whom exclusion from the cultural and spiritual stimulus of a temple (as sought by the parents in this case) is indeed a great injustice. This entry was posted in Area and tagged Cultural Geography, Development, disability, Economic Geography, Environment and Society, exclusion, Global Issues, India, policy, Political Geography, Social Geography, stigma, UN, Urban Geography, Women on June 27, 2010 by Michelle Sushikala Brooks. This week is Refugee Week with events around the UK revealing the socio-economic contributions of refugees to the UK through events ranging from small community exhibitions to big music festivals. In Leicester alone 30,000 jobs have been created by former refugees (http://www.refugeeweek.org.uk/). It is perhaps also an opportunity for us as geographers to consider our contributions to debates around this issue. New research by geographer, Professor Heaven Crawley, shows that contrary to popular misconceptions, refugees (those who may be re-classified as asylum seekers upon arrival) often have little knowledge of where they will end up until they arrive in the United Kingdom. Having fled their homes and often their families, travelling for days or weeks by various methods they are often entirely reliant on other agents to reach safety, wherever that may be. The empirical research in the report for The Refugee Council challenges the accusation against asylum seekers as ‘benefit tourists’ (who choose the UK because it is soft on benefits etc) making obvious the fact that when fleeing an environment of fear, violence and persecution, there is little space or time for choice of destination. It is possible that the act of entering the UK illegally lends weight to the idea of refugee asylum seekers as exercising choice in coming to the UK. However, as the report for The Refugee Council states, there is no legal route to enter the UK in order to make an application for asylum, which is extraordinary considering the UK commitment to the Refugee Convention (1951). Importantly, it can be argued that criminalising this process is the first step of adding discrimination to the long list of injustices that many such people have already suffered. Such discrimination in a legal framework can be seen to percolate into the public consciousness through for example, the news media and entertainment industries, leading to judgements based on assumption rather than research grounded in empirical data. In addition to the report ‘Chance or Choice’ for The Refugee Council it is interesting to also read an article by Jonathon Darling for Area on activities since 2007 in Sheffield as a ‘City of Sanctuary’ and an article by Heaven Crawley for Area on the forced migration of children and their experiences upon entry to the United Kingdom. The UNHCR World Refugee Day is Sunday 20th June which will be marked by an umbrella parade in central London and celebrates the fact that the United Kingdom still offers a place of refuge for those fleeing war, torture and persecution (http://www.unhcr.org.uk/about-us/events.html). The UNHCR supports Refugee Week. It is an opportunity for those of us who are lucky enough to have never known life as a forced migrant or refugee to feel proud that as a nation we can collectively, as a community of communities, provide safety for those who are not so lucky. This entry was posted in Area and tagged Asylum, Cultural Geography, Development, Economic Geography, Environment and Society, Global Issues, London, Political Geography, refugee, sanctuary, Social Geography, UK, umbrella parade, UNHCR, Urban Geography on June 13, 2010 by Michelle Sushikala Brooks.